The Ecological Hoofprint: The Global Burden of Industrial Livestock. Tony Weis. London: Zed Books, 2013. When we think about the ecological effects of livestock agriculture, many of us reflexively think about soil erosion, water pollution, or cutting down the rainforests. Tony Weis, in The Ecological Hoofprint, shows that there is much more going on. There is an entire social framework underpinning livestock agriculture. This framework consists of political structures to legitimize extreme exploitation and an ideology to match. Ultimately, it is this social framework which is the problem, even more than the individual decision to eat (or not eat) meat. 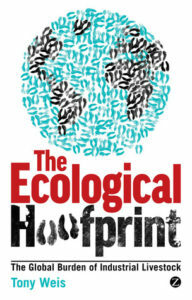 The Ecological Hoofprint is not just a catalog of the environmental problems with animal products. Weis develops the idea of the “meatification” of people’s diets, and explores the role this meatification has on society. The effects of industrial livestock ripple outward from the dinner table to affect everything about our food system, and even basic questions of inequality, social justice, and world hunger. It is not exactly a quick read. But it is not long (155 pages), with just four chapters, and the author does not waste time getting down to business. The livestock industry has wrought vast ecological changes across the landscape. These unpleasant consequences are typically blamed on “the population problem.” Alas, there are so many human beings! How will we feed them all? Of course, we do have a population problem, but it is mostly a problem with overpopulation of livestock, which vastly outnumber and outweigh humans at this point. The system of meat production has deepened and strengthened global inequality. We are dividing the world into two sectors — a wealthy sector eating meat, and a poor sector (with Africa and south Asia leading the way) lacking even the food basics. “Meatification” of diets both creates this inequality and then perpetuates it, through an ideological system designed to make meat-eating seem normal and necessary — meat is necessary for protein, the meat industry is incredibly efficient, everybody wants meat anyway. The underlying mechanism causing this result is the “industrial grain-oilseed-livestock complex.” This is capitalism applied to agriculture — an agriculture which constantly seeks to expand itself at the expense of humans, animals, and the environment. This exploitive system just chews up everything in its way, whether that it is cows, people, the land, or the climate. Historically, social inequality has gone hand in hand with meatification. Some elite groups have meat and plenty of food, while other groups lack food security altogether. The Green Revolution, artificial fertilizers, and GMOs, have done nothing to alter this basic logic. These technical achievements, instead of doing something useful (like feed the poor), are simply fuel to help the livestock sector expand. The huge surpluses of cheap food (grains and oilseeds) are soaked up by the livestock industry, laying waste to fully 1/3 of the world’s grains before we even get to the other implications. Meatification has changed the face of the planet. It has caused soil erosion, water pollution, climate change, public health problems, extinctions of wildlife through the decimation of habitat, and degradation of those involved in raising and slaughtering the animals. At the same time, all moral responsibilities for this “are pushed into the collective unconscious of modern societies” (p. 143). The author doesn’t advocate universal veganism, just drastic reductions of livestock. (He may be vegan personally, he doesn’t say.) He says that the “framework of the ecological hoofprint can’t settle intense debates about whether people should eat some but less meat, none, or no animal products at all” (p. 153). He’s clearly familiar with the literature and cites Michael Pollan and Howard Lyman as examples. What he is guarding against is the tendency to reduce the discussion of meat to a purely individual matter, “voting with your fork.” This is not to say that personally being a vegan isn’t important as well, but there’s a lot going on here, and most of it isn’t about making better individual choices at all, it’s about the politics of food — which is Weis’s primary interest. The author only briefly mentions relevant health issues — but doing so would have opened up an entirely different and lengthy set of questions. The author could have spent just a little extra time explaining what “oilseeds” are: seeds processed for oil. 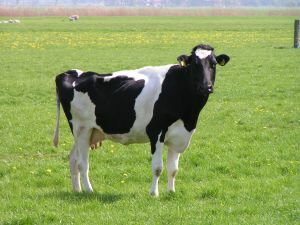 Corn oil in the supermarket is only half the result; the other half is fed to livestock. After the oil is pressed out of the corn, the pulp is fed to cattle. So all those processed oils in your food and in your pantry are actually part and parcel of the livestock industry — another reason to avoid refined fats and oils, vegans. This is an excellent book, but it leaves me with one final question. This book came out FOUR YEARS AGO, and has endorsements by Peter Singer and Frances Moore Lappé. Why am I just NOW finding out about it? Did I miss a review in VegNews, or is it buried in some Facebook post I overlooked, or what? Part of the explanation may be that the book is academic, the author is Canadian, and the publisher located in Great Britain. Yet it surely deserves more attention than I see it has received so far. I found out about the book totally by accident, while reading an entirely unrelated article. This entry was posted in Ecological Economics, Limits to Growth, Vegetarianism / Veganism on July 6, 2017 by Keith Akers. Thanks for this helpful review. One reason this book may not be more popular is that it is expensive on Amazon ($21.66 for a short paperback) and no one has submitted a review yet. I will submit a request for my library to order it. Thanks again! Well I may correct that, may write my own review. I got a used copy from Amazon for ten bucks and shipping. It’s worth mentioning that the author was also a witness for Anita Krajnc in her recent Toronto trial for giving water to pigs.